LAFAYETTE, Calif., October 4, 2017	(Newswire.com) - Android users can now get in on one of the highest rated shopping apps around as the award-winning Shop It To Me service is now available on both Android and iOS devices. The Shop It To Me personalized sale alert service is the App Store’s leading free personal shopping sale assistant for clothing, shoes and accessories. Shop It To Me has millions of avid members nationwide through its iOS app, website and emails. Shop It To Me’s new Android launch means the estimated 107.7 million US Android users will now have the same ultra-convenient access to personalized sale alerts as their iOS counterparts. Sign up is free and once installed, the shopper simply chooses from a list of their favorite brands (i.e. Joie, rag + bone, Anthropologie, Vince + hundreds more to choose from) and their sizes. Shop It To Me checks hundreds of retailers’ websites every morning and sends an alert as soon as a favorite item goes on sale in the desired size. It’s fashion magic made simple. The smart intuitive app design has everything a spending-savvy shopper needs, including an option to heart items they love to get additional price drop alerts for even bigger savings. The Shop It To Me App also has a search and filter function, allowing members to easily find the items they want across all of the sale items currently available. 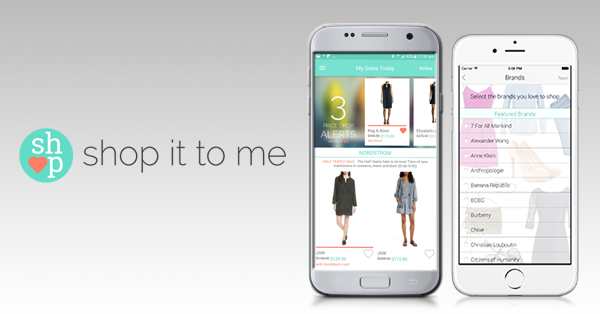 The Shop It To Me app ensures contemporary fashion shoppers can keep their fingers firmly on their purse strings without compromising on style. The app offers an interactive way to find out when favorite items go on sale in their size, meaning no more lusting after the one that got away or scouring through endless pages of sale items only to find the finally marked down dress, top or pants aren’t available in the correct size. As well as giving shoppers instant access to their most wanted closet additions the instant they’re discounted, the app helps users jump the virtual queue by sending an alert when the discount goes live and giving the user the option to purchase the item directly from the store before it sells out. To find out more visit: https://www.shopittome.com or download from Google Play or the App Store. Source: Shop It To Me, Inc.